THE RETIREMENT DATE IS JUNE 2014 -giving less than a year to have A BIGGER THAN LIFE SALE after 35 YEARS OF COLLECTING . 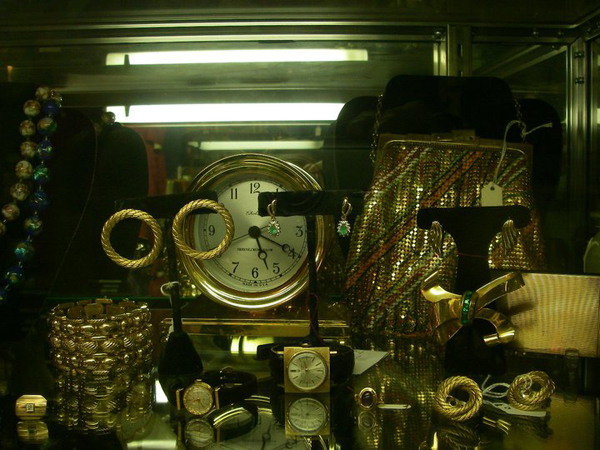 Now is the time to visit Archangel Antiques if you haven't had the experience to see one of the city's most unique collection of rare vintage pieces and the most charming and helpful staff. It is sad news that NYC will be loosing a priceless shopping experience. After doing antique shows from Maine to Florida, Gail and Richard decided to open a shop in New York City They found a store at 334 East 9th Street in the East Village between 1st and 2nd Ave. Two years later Michael Duggan joined us and added his vast fashion experience to their encyclopedic knowledge of jewelry and collectibles, photographica, memorabilia & oddities, etc. Three years later they expanded into the shop next door and have been in the same location for over 20 years. Archangel Antiques carries a huge collection of cuff links from 1880 through 1980s. In addition there tie bars, shirt studs, collar pins, lapel pins, vintage ties and collars and other related items. Their specialty is antique and vintage clothing buttons from the 1850s to the 1970s with a colleciotn of literally millions of buttons. There is an endless array of unique items- collectibles, Americana, folk art, oddities, do-dads, antique and vintage items of all kinds.